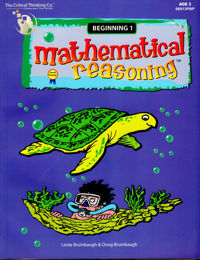 This book is a complete math curriculum for toddlers. The engaging activities, easy to follow explanations, and variety of examples teach the concepts of counting, adding, and subtracting using the numbers 1 to 5. Spiraling slowly, children are also taught geometric shapes, colors, sequencing, classification, and visual tracking. Activities are easy enough to build confidence but challenging enough to keep their interest and build their problem solving skills.